Paul Pacuilla grew up in Southern California where his experience as a General Contractor enabled him to explore hands-on his passion for homes. Becoming a Realtor and connecting clients with homes and land was the ideal progression for Paul. In 1996, fusing his love of surfing, travel and real estate, Paul moved to Kauai, set forth on a mission to turn the life of his dreams into a reality. Having spent his first year in Lihue, five years on the south side, and over a decade on the North Shore, he has a valuable understanding of what the whole island has to offer. This knowledge mixed with his ability to negotiate the best value for his clients makes Paul a strong asset. 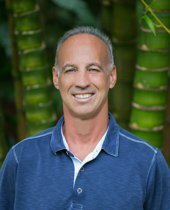 With over two decades experience representing the nations largest real estate companies on Kauai, Paul saw an opportunity to create a local brand and established Reside Kauai, LLC in 2013. Rapidly, Reside Kauai has grown into a thriving agency, attracting an experienced collection of top performing agents. One of the cornerstones of our local brand is the ability to help support island causes such as Pu'ukumu School, The Na Pali Race, Haena to Hanalei run, Kauai Food Bank, Habitat for Humanity, Adopt a Highway, and the Garden Island Motorcycle Club to date. "I wake up grateful for every day I get to spend on this idyllic island and for the opportunity to help others realize their own dreams, whatever they may be. I like to be straightforward, keep it simple, and find the way I can be of most use to my clients." Halelani Village At Puhi Ph Ic Bldg. Listing courtesy of Reside Kauai, LLC.